In the morning went to the Provo Canyon. Parked at the Canyon View Park. Warmed up a mile. Another mile with ankle weights. A 1.5 mile tempo uphill with tailwind in 8:37. Then 8 100 meters strides down. Then 8x300 down averaging 50.5 with 200 meter recovery. Mostly into a headwind. I wanted to do 16, but the rain with some hail changed my mind. I figured it would not be a good idea to jog the recoveries since I just had a T-shirt. So I decided to do a 3 mile tempo run instead. 1.5 up, immediate turnaround and 1.5 down. I finished off my 8th repetion in 48.8, jogged 200 meters, and started the tempo run. The wind kept changing direction. It was easy to tell when it was a foe. You could kind of tell when it was a friend by the unusual ease of the fast quarter splits. First mile up 5:41. 8:38 (2:57) at the turnaround. Two miles in in 11:24 (2:46, 5:43), next half in 2:44, last half in 2:40. Last mile 5:24, total time - 16:48. After the sprints, the form felt really good in spite of the cold. The hamstrings were working very well, much better than on Saturday. I suspect that part of the problem Saturday was something weird I got Wednesday from running hard in the warmer conditions. Afterwards, my eyes have been irritable for the next two days, the throat was slightly sore, and my weight Thursday morning after the run was down to 139 from regular 143-144. I have regained it since. Sunday rest + eating a lot did the job and felt much stronger running today. Now Benjamin picked up a new trick from me. The other day he got on the scale, saw his weight , and said - "Daddy, see, I weigh only 47 pounds - this means I need a snack!" Ran with Benjamin, and Jenny later in the afternoon + a bit of always on the run. Total of 13 miles for the day. George was running trails today as the roads started bothering his shins. So I just ran with Eric. Turned out he skipped his Saturday long tempo, and also did not get to run Monday. I suggested we do a tempo then, since that would have made him very well rested for one. We did three Slate Canyon loops, and then added a rolling 1.75. His time for 8.08 was 1:01:45 - steady 7:39 average, not bad at all for all the hills, the cold weather, the wind, and some extra clothing. It is an indicator that he will not completely die in Ogden. Not before 8 miles at least... I suggested he should start out at 8:15, and do that for as long as he feels good, then when that stops feeling good, back off and jog to the end for a cooldown. We live in a politically correct times - so let's not call it a wall anymore, let's called it a premature cooldown. Dropped Eric off, jogged a bit, and did a 1.25 mile tempo in 7:14. With an earlier pitstop acceleration, that gave me 2 miles of tempo running for the morning, and 10 total. During the day, ran with Benjamin and Jennifer + always on the run. Did a 0.5 tempo in 2:50. Total of 13 miles for the day. After last Wednesday I decided it was time to start doing all fast workouts in the morning, as the afternoons are getting hotter. Wednesday mornings are challenging because I need to be at the temple at 8:00 am, but I really like to have a fast workout on Wednesday. So I had to come up with one that does not take a long time, and that I can do near my house. After some thinking, I invented one. 4 Slate Canyon loops with a tempo from the highest point magic mark to the lowest point magic mark (1.5405 miles) with a jog uphill in between. This non-standard strech is 12 extra seconds at 5:00 pace over 1.5, 13 at 5:20, and 14 at 5:40 approximately. It was dark at 5:40 am when I started the workout. As dark and as early as it was, I did not expect much out of the first repetion. Got 8:49 - I just wanted to break 9:00. Then as the sun was rising, and as I was gradually waking up, the speed increased. 8:30 - 8:16 - 8:04. The stride felt good - wide and relaxed, just what I need, although I feel it still ought to be wider, smoother, and more relaxed. 9 miles for the workout with the warm-up and cooldown. Ran with Benjamin, Jennifer, and Julia. Did always on the run. Ran with Joseph in the stroller + ankle weights for a mile. Total of 14 for the day. Ran easy this morning with Eric. Dropped him off, and did some tempo running. First half a mile in 2:49. Then jogged up the hill, and did the 1.29 stretch from the Slate Canyon trail entrance to my house in 7:19. Felt good, quite relaxed, the stride felt wide. Did a run with Benjamin and Jennifer. Jennifer had an assignment to run a sub-10:00 mile. She started the first quarter in 2:34. Then we saw two teenage girls jogging ahead of us. I challenged her to catch them. She took the challenge, and gradually reeled them in right before the turnaround. This resulted in a 2:05 quarter, and a 59 second 200. Now with the half in 4:39 Jennifer was on record pace for the mile. We turned around, and she only slowed down a little from the chase gear. Next quarter in 2:14. With 600 to go Benjamin decided to take off, but Jennifer was holding on strong, hanging in their only a couple of seconds behind. Benjamin kicked into a high gear trying to drop her,but Jennifer had a high gear of her own. He ended up 3 seconds ahead of her at the end with 8:44 (so much for his easy run), and Jennifer got a 30 second PR of 8:47 with the last quarter in 1:53. She also set a PR on half mile - 4:08. Joseph in the meantime witnessed this historic moment from the stroller, while Julia was taking a nap at home. Did another 2 miles with ankle weights for always on the run, one of which with Julia in the stroller. Total of 13 miles. Eric had to go to work early. George was still running trails. So I had to run alone. Jogged a bit, then got bored and ran a 0.5 mile in 2:53. Jogged to the top of the Slate Canyon loop, and ran a solid 1.54 tempo down in 8:00. Felt good. Jogged some more, and got bored again. Ran a mile in 5:47 with the last quarter uphill, but the third one down. The mile was a net up. Then I finally was over my boredom, and jogged some more to make it 10 miles. In the afternoon and evening did my standard always on the run, and the runs with Benjamin and Jennifer. Ran the Salt Lake 10 miler from the East Canyon Gate to the This is The Place Monument by the Hogle Zoo. Got 2nd place with 52:12. The first two miles gain 300 feet, then the rest is a gradual 1500 foot drop. I hit the first mile in 5:15. My teammate Bob Thompson and Delfino Arevalo were ahead a bit. Delfino had 5:07, while Bob 5:10. I did not expect it to be so fast going uphill, but it hurt bad enough for me to believe the mark was accurate. The grade increased on the next mile. I did 6:17, and Bob and Delfino opened up another 5 seconds on me. I liked the next mile a lot better. We reached the top of the Little Mountain, and started going down. Nice grade. 5:06. Believe it or not, Bob and Delfino still opened up some more distance. I should have expected it of Delfino - he is a 29:02 10 K runner, and although somewhat out of shape, should be able to go sub-5:00 pace on this type of grade no problem. But I had never seen Bob run like this. Another mile - 4:54, then 4:57, 5:09, and 5:08. I like the pace, but not the sight of Bob and Delfino moving away further. All of a sudden Bob stopped at mile 7 and started walking. Still not sure what happened to him - probably an injury. Next mile, 5:23. It flattened out a bit. Then the downhill resumed in full force - 5:08, and 4:55 for the last mile. Delfino got 49:47. Not sure what to think of this performance. I felt good all the way, but at the same time, I felt that if I'd put the hammer down, my form would get worse, and I would just be working harder to run the same or even slower pace. Overall, I would describe this run as enjoyable. I liked the feedback I was receiving from my muscles as I went down the hill. I also liked being able to shift gears quickly after running hard on the uphill. My quads did tense up a bit during the climb, but I was able to relax them quickly. Did some more always on the run, and ran with Benjamin and Jennifer. Also ran a mile with ankle weights. Total mileage - 16.5 for the day. 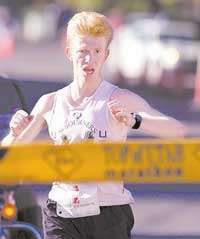 Jennifer set a record on the last half-mile - 4:02, and on the last quarter - 1:49, as well as on the last 100 - 25. She sure made Benjamin work. Good for him. He needs it.